In a previous life I worked at one of the best ad agencies in the Bay Area. It wasn't quite Mad Men, but we did have our Friday open bar, our eccentric namesake, and our brilliant but misunderstood creatives — who gave me some pearls of wisdom that resonate to this day. 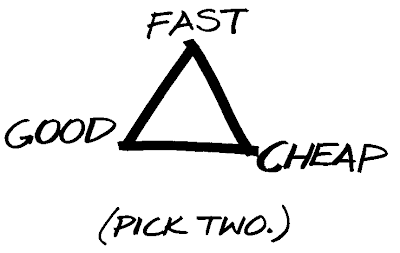 Perhaps the most impactful was a simple graphic on an art director's door: a triangle with the words "fast," "good" and "cheap" at its points, anchored by the admonition "Pick Two." I've come across this concept a few times since, so I don't think it was Kathy's invention. But at the time, it hit me like a lightning bolt: Anything is possible, and everything has a price. 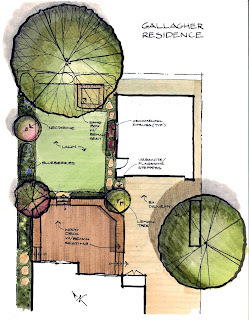 Landscape designers, architects and contractors confront this triangle a lot. Especially this time of year, when folks remember they wanted a new back yard for the kids to play in this summer. They call me, full of optimism and good ideas… and their disappointment is audible when they realize I can't start on their landscape design immediately, or that the consultations I can offer in the next few weeks (to get them off to a roaring start with a landscape contractor now) actually cost money. Is the problem that we live in an age of instant gratification and commoditized services? The internet has made seemingly all things available to all people, and often for free: want a book tomorrow, without the inconvenience of driving to your local bookstore? Amazon does that. Want to try on shoes, without having to drive to the store or pay to receive or return them? Zappos has you covered. But landscape designers and contractors aren't retailers. Our work isn't a commodity that can be comparison-shopped. Sure, the local gardener can advertise design services just as legitimately as I can (though there might be vast differences in our training), and probably get to your project a lot sooner. He probably costs a lot less, too. But would he and I give you the same artfulness in our designs, the same thorough process, the same attention to detail from beginning to end? "Fast and cheap" still carries a cost. My neighbor, who is incredibly nice, smart, and well-intentioned, took it upon himself around Hallowe'en to rebuild his front irrigation system. I remember the skeleton bones he poked out of the trenches; great effect. But now, some three months later, he's just finishing the project (although still sans plants). Is his labor cheap? Definitely. Good? Probably. Fast? Not so much. (the graphics, not the ideas)At different times, I'm different legs of the triangle. My clients will tell you I'm pretty good. And depending on the circumstances, I can be relatively cheap, or pretty fast (as those Landscape Smart episodes attest). I'm not immune to mistakes, especially when I try to cram too much work into too little time; that's when "good" gives way to "fast." The only way to reclaim "good" is to put in more hours, usually in the middle of the night, and there goes "cheap." I've worked with all types of clients. Some are willing to sacrifice "good" in the name of "fast and cheap." They're the ones hiring unlicensed contractors who don't bond their projects or pay worker's comp insurance. These aren't my ideal clientele, because there's no assurance the project will turn out well, and no real recourse if it doesn't. My favorite clientele are the ones who choose "good", and realize that choice includes a tug-of-war between "cheap" and "fast." I've built my business, and my reputation, on providing "good" (well, actually, "great"). So that leaves either "cheap" or "fast." I'm happy to be either. I just can't be both.